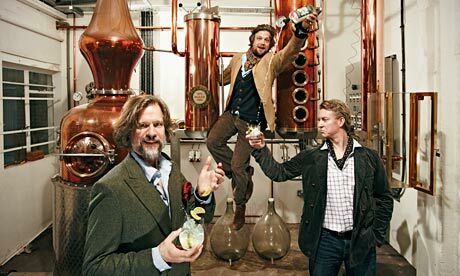 There’s something of the mad scientist’s laboratory about Sipsmith’s HQ. It’s a garage, basically, on a suburban west London street, and looks like a cross between Dr Frankenstein’s workshop and a crystal meth lab. Or how a crystal meth lab might have looked had they existed in Victorian times, because dominating the single room is a beautiful, hissing, copper still. And then there are the proprietors, whose names suggest that they too have stepped out of the 19th century; Stamford Galsworthy and Fairfax Hall, and soft-spoken master distiller Jared Brown, from New Orleans, who has created spirits all over the world.